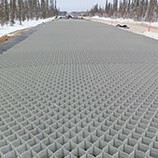 Tough Cell is a unique cellular confinement system or “geocell” for soil stabilization & reinforcement that enables cost-saving and sustainable road construction on challenging and problematic soils. 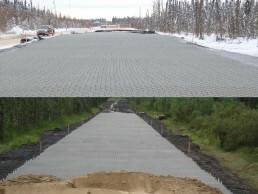 Tough Cell is a unique cellular confinement system or “geocell” for soil stabilization and reinforcement that enables cost-saving and sustainable road construction on challenging and problematic soils. Tough Cell allows you to build lower-cost, sustainable roads, all year long, while reducing up to 50% of your project’s cost and duration. Tough Cell is fabricated from Neoloy, a novel nano-polymeric alloy which maintains its dimensional stability in a wide variation of temperatures (-60⁰ to +60⁰), under dynamic and cyclic loadings, and is highly resistant to polymeric creep. Extensive, worldwide project experience and a deep understanding of geotechnical engineering and the working mechanisms of cellular confinement technology are key factors in combining this innovative and cost-saving technology with established and accepted design methodologies for innovation application and successful projects. Where Can You Use Tough Cell? Tough Cell is the strongest and most durable geocell, suitable for load support, steep slope stabilization and earth retention applications in wide variety of markets- public transportation, government, oil and gas, emergency infrastructures, military, mining, logging, railways, airports and many more. 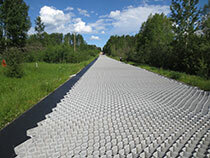 Typical large-scale projects require combined applications and solutions for flexible pavements, roadway construction, access road construction, soil stabilization, slope/channel protection, embankments, gravel roads and retaining walls. 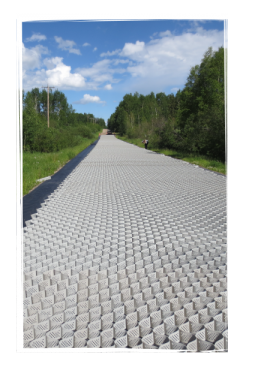 Tough Cell offers a comprehensive solution for most infrastructure projects while setting a new standard in the world of access road construction, soil reinforcement and ground improvement. When dealing with complex projects and multiple challenges, Tough Cell has cost effective solutions that significantly reduce road repair, maintenance, use of virgin aggregate materials and roadway construction time. 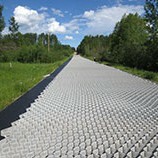 Tough Cell Neoloy Geocells contribute proven benefits to road construction and soil reinforcement stabilization. This innovative yet proven technology enables great improvements both in economic and engineering aspects that lead to unmatchable cost-effective solutions. Use of local infills, reduced transportation costs due to Tough Cell's foldable properties, long term durability and low maintenance needs, fast installation with local work crews and all-weather installation, versatile project adaptation according to specific needs. 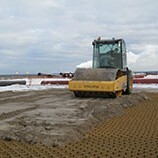 Tough Cell does not require transporting costly aggregate to distant project sites and enables the use of non-cohesive locally available infills (sand, RAP, and recycled materials). Tough Cells’ stiffness, passive resistance of the geocell mattress and the “Beam Effect” working mechanism help increased subgrade strength result in less vertical stress, enabling layer thickness optimization in structural support for road construction. Optimized layer thickness means lower material and infill costs, as well as faster installation. The combination of geotechnical structure and the Neoloy material in the Tough cell solution enables project lifecycle extension of up to 75 years. 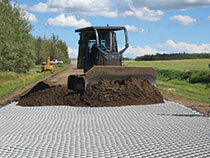 Transportation needs in means of space and weight are reduced, road construction time is made cost-effective and can be done with any locally found soil in any weather conditions. 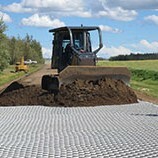 The ability to incorporate and foster vegetation growth, reduction in the need for chemical stabilizers and the reduction of aggregate consumption, hauling and construction machine time enable achievement of a significantly reduced carbon and environmental footprint while maintaining an aesthetic landscape. 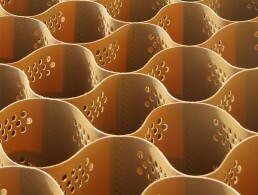 Tough Cell is a high-performance geocell made from Neoloy and structured into a 3D honeycomb formation. 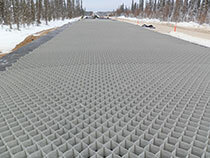 This cellular confinement system ensures more cost-effective roadway construction , better load and stress distribution by increasing the pavement’s layer strength. When vertical loading is subjected to the Tough Cell mattress, a semi-rigid slab or “Beam Effect” is formed over the soft soil, distributing the load more evenly and decreasing the stresses transmitted to the subgrade. A Novel Polymeric Alloy (NPA) of polyester/polyamide nano-fibers dispersed in a polyethylene matrix, developed to improve the long-term stiffness and Long Term Dimensional Stability (LTDS) of the geocell. Neoloy is a nano-technology material that combines the ductility of polyethylene with the stability and resistance of polyamides. Its characteristics include extended elastic stiffness under dynamic loads with higher tensile strength, very low polymeric creep and increased structural integrity in extreme temperatures and challenging environmental conditions. Tough Cell is structured into a 3D honeycomb formation of cells. This geocell structure mitigate vertical load the passive resistance of adjoining cells , distribute the vertical load on a larger area reducing the strain on one spot and maximizes the load bearing capacity of soil beneath. The Tough Cell wall perforations and their friction with the soil provide anchoring soil interlock and drainage as well as allowing root proliferation ensure even greater rooted soil mass reinforcement. 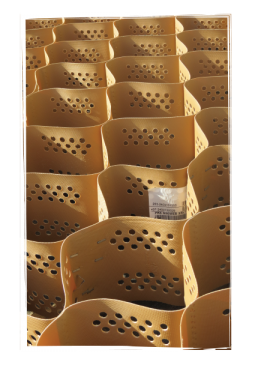 The same perforations optimize water drainage by limiting the hydrostatic buildup. 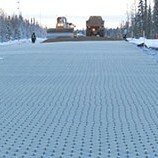 The Tough Cell Geocells in road construction applications has been widely tested and researched over the past 10 years. World renowned geotechnical experts have collaborated and published over 55 professional papers regarding Tough Cell technology and the Neoloy nano-polymeric alloy. Leading institutes took part in this extensive testing and certification process, amongst them are: US Federal and State Departments of Transportation (DOT), US Federal Railroad Administration (FRA), KOAC-NPC Road Standards Institute- Holland and many more transportation and geoengineering authorities around the world. Tough Cell has been successfully used in many projects in industries and applications such as municipal and government, oil and gas, mining, landscaping, railways and airports, emergency and military and many more. 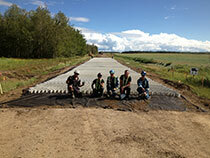 The Village of Ryley's main road needed a major rebuild with a limited budget. 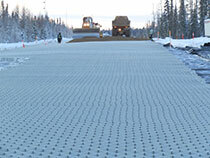 By using Tough Cell for the project, a durable road was successfully build with 25% reduction in excavation and asphalt use, 20% less CO2 released into the air and more than 50% maintenance costs reductions expected over the life of the road. 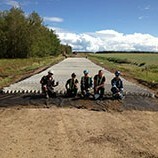 MEG Energy urgently needed to build a road before winter, including the passage over a very deep swamp. 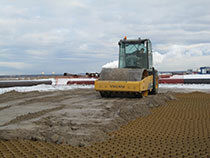 Tough Cell allowed for the construction of a durable access road in only 40 days, by using locally available sand.